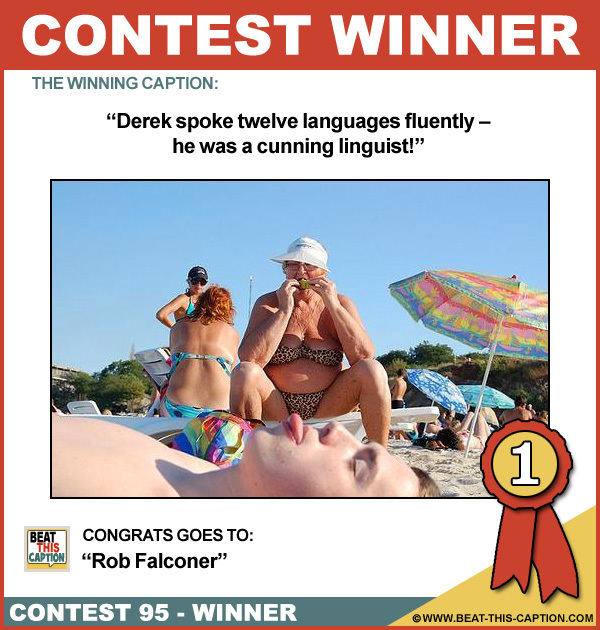 Beat This Caption Contest 95 Winner – Caption Contest Funny Clever Witty Enter Today! Derek spoke twelve languages fluently – he was a cunning linguist! Some languages flow off the tongue better… Slippery, but Wet Caption! ;) You WIN! I see he likes his bacon crispy! Is pink slime safe for you? Larry was a real bottom feeder! I’m not sure what you are looking for but it is a little to the right! He wasn’t sure which was worse, exposure to U.V. or her V! Grandpa’s pet name for me is picklepuss!